I have missed my regular blog slots with you all - my intention to post at least monthly during my MA has proved too ambitious. 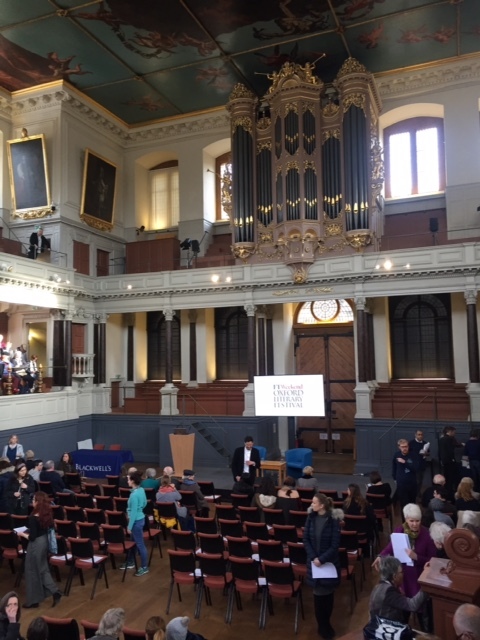 But I'm here now, and eager to share newly-regenerated enthusiasm engendered at the Oxford Literary Festival. The paperback release of Kate Atkinson's Transcriptions plopped through the letter box at the start of the Warwick Easter break. I determined to use the vacation to read books other than those on the course - books I can actually write about with you! A big fan after I first read Life After Life, Kate Atkinson is one of those dependable authors I look forward to. Transcriptions is set in London in the war and features Juliet Armstrong, a young woman selected to type for MI5. Her potential for espionage is soon spotted and she is given undercover jobs to infiltrate the fifth column - a network of Nazi sympathisers who sought to subvert the British war effort. Despite its lofty subject matter, the book is quite lighthearted and has humour throughout. 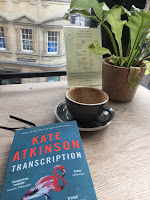 I heard Kate Atkinson during Cheltenham's Literary festival in the autumn, and her reading of the section when Juliet goes out with her boss hoping for a little seduction, is highly comical. There is a penchant for parenthesis throughout which serve as wry or comic asides, and I confess that I found these very irritating. Previous pupils of mine will no doubt remember how I endeavoured to rid them all of the practice of overusing brackets! This was my view as I finished reading the novel. 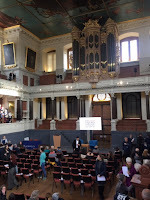 A bit of a dedicated book tourist, this was the first of three days I spent at the Oxford Lit Festival. I found a quiet corner in Waterstones cafe overlooking the apex of George Street and Cornmarket Street and sipped a latte. It was as hushed as a 1970's library, with everyone either reading or working on laptops. Bliss. I liked the central character of Transcriptions, but admit that many of the other characters tended to merge. Her boss, with the delightful name of Peregrine Gibbons, is nicely drawn, though perhaps a bit of a 1940's English stereotype. The other key figure, Godfrey Toby is deliberately elusive, "a master of obfuscation." For this reason, he and the other shady characters of British intelligence seem to live in the shadows of the text,emerging only when they have a starring cameo, if there can be such a thing! Running alongside the 1940's story is one set a decade later when Juliet is trying to discover who she is post-war. Juliet is now working for the BBC, and Atkinson makes parallels between the secret service and the broadcaster. The remnants of the war story spill into the present and some of the mysteries of surveillance, subterfuge and disguise are revealed in the denouement of the novel. Though definitely worth a read in the holidays, this isn't my favourite Atkinson. It seems a bit too light for its subject matter, which even the naivety of the protagonist cannot fully justify. As the plot becomes more dense, difficult scenes have the same light, almost dismissive touch as earlier chapters. As a result, I was left wanting something more. My next read was a delight - what you'd expect from the multiple award-winning Kazuo Ishiguro. This was a further delight of the Oxford festival. I'm slowly ticking off my I Spy Book of Karen's favourite authors, and this one was a treat of Nobel proportions. 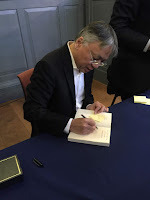 In Oxford to collect the Bodleian Medal rather than to promote a new title, Ishiguro was in conversation with the Head of the Bodleian Libraries, Richard Ovenden. Memory is a key theme in many if Ishiguro's novels, and he challenged the librarian about the subjectivity of archiving. He expressed concern that preservation can be too temporal - at risk of retaining only that which society values at the time. Ovenden concurred, relating the tale that in the nineteenth century, the library passed up the opportunity to house first-edition copies of works by female authors...thus the George Eliots, Jane Austens and Bronte collections all went elsewhere. To remedy such an oversight, they have since been purchased at significant cost, proving that custodians of the past really do need an eye on the progression and developments of the future. Another exciting conversation that took place that day was a reunion with an old school friend. We survived the ages of 11 to 16 firmly at one another's side - I needed to stay close so that I could copy her maths - but we have seen each other only once or twice since our paths diverted in 1988. It was a real pleasure to pick up where we had left off, to swap family news and share our love of books. 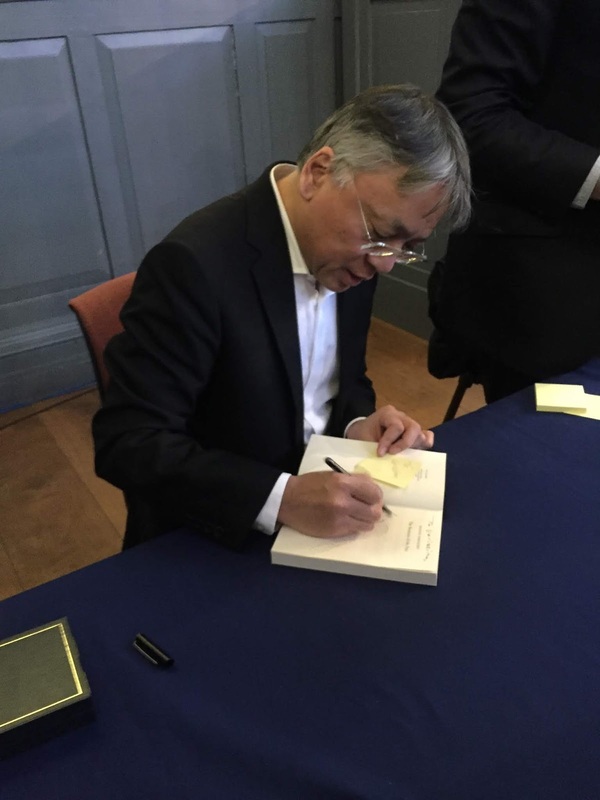 We were both very happy to queue for Kazuo Ishiguro's signature. I keep telling my children that their inheritance lies only in my signed copies, but they are dubious that my bookshelves will ever become a veritable goldmine. They are treasure to me however, and I'm seriously thinking of adding signed books as another shelf category! 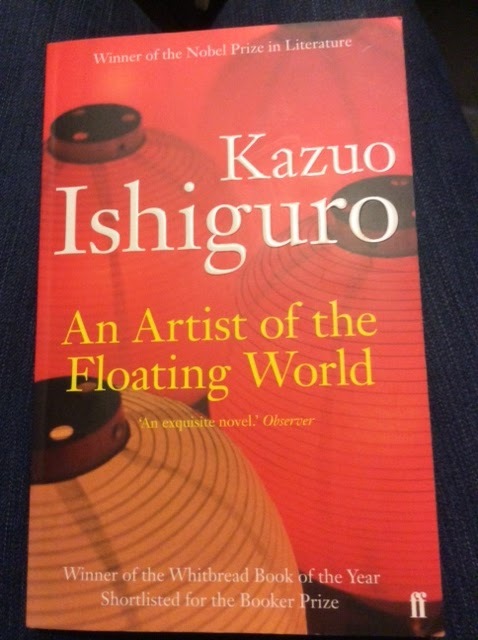 The Ishiguro book I have just finished was An Artist of the Floating World. All his novels are rhythmical and beautiful. They force you to slow down and experience the language as well as plot, setting and characterisation. Set in Japan, coincidentally in a comparable time period to Transcription, 1948-1950, this book explores post-war rebuilding through the focus of one family. The protagonist is a retired artist who is in negotiations for a marriage on behalf of his younger daughter. This arrangement has echoes of a fading traditional Japanese culture, and is one example of the old being juxtaposed against the modernisation and democratisation of the country. Much of this book is reflective, as Masuji Ono remembers his early days as an artist, first in the Takeda firm where he was required to paint quickly for foreign commissions, and then under the tutelage of Seiji Moriyama where he was encouraged to take more time and trouble over his talent. The setting for Moriyama's art was "the floating world," the small hours of the night when the city takes on a different characteristic. He explained to his tutee that "...when I look back over my life and see I have devoted it to the task of capturing the unique beauty of that world, I believe I will be well satisfied." Preoccupation with recall is peppered throughout the narrative reflection, "It is possible of course, that Mori-san did not use those exact words...such phrases sound rather more like the sort of thing I myself would declare to my own pupils after we had been drinking a little at the Migi-Hidari..." Thus the reader doubts the reported conversations in the attempt to try to piece his past together, wondering what he might have done that would cause disharmony in marriage negotiations or cause distress to his former acquaintances. There is a hint of decadence in his painting of the world of geishas and drink and the entertainment of the early hours of the morning, and you wonder whether this widower may have more secrets to tell. The backdrop to Japan's history in 1948 is the picking up of a nation defeated in war. Politics hedge around this novel and bleed into its art, but it is a subtle, insidious creeping. Coupled with some caution over the reliability of the narrative voice, this novel weaves many threads into the story of one man, one family and one nation. This was an excellent read which I would love to revisit. I ended my adventures in Oxford by lunching in a quiet cafe overlooking the site where Cranmer met his death in 1556. 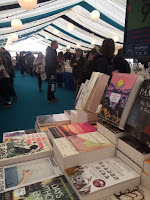 After a delicious goats cheese and onion chutney panini, I meandered to the festival marquee where I read Mr Ishiguro's novel and eavesdropped on a young author chatting to her publicist about food writing. Kate Young was conversing excitedly about her new home, her success in Germany and how a blog writer came to be a published success...all inspiring stuff. 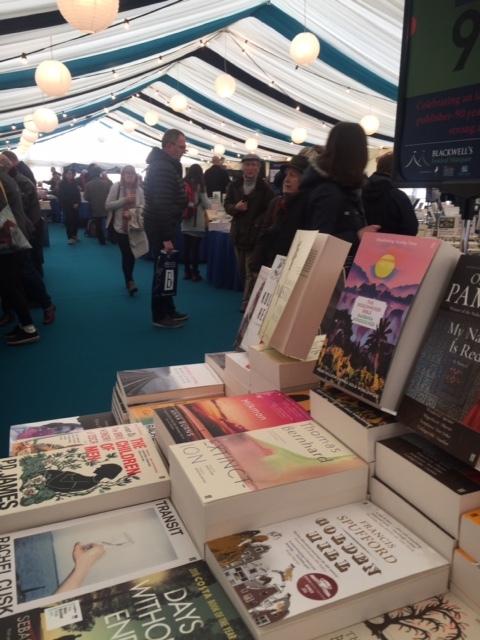 I wished her luck as she took the stage in the vast literary tent, and was bold enough to encourage her to shine a light on her talent rather than bashfully hide it under a bushel. A lovely lady - I wish her much continued success. Following two steaming cups of tea and a yoghurt and berry flapjack, I closed my book and headed to the Divinity School where I was groupie enough to queue for door-opening. Having travelled to North Cornwall a couple of years ago to hear Patrick Gale interview Maggie O'Farrell, I was eagerly anticipating seeing him again. This time he was being interviewed about his latest novel, Take Nothing With You. 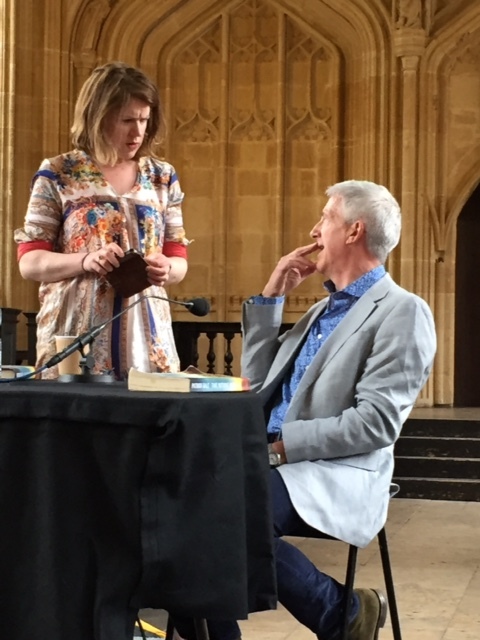 I happened to get the best seats in the house and sneaked a quick photo of him and Sophie Ratcliffe before the "phones off" instruction was issued. As in Cornwall, he was delightful, engaging and warm. I remain a dedicated fan! I'm in the middle of the novel now, so I promise another blog post before too long. 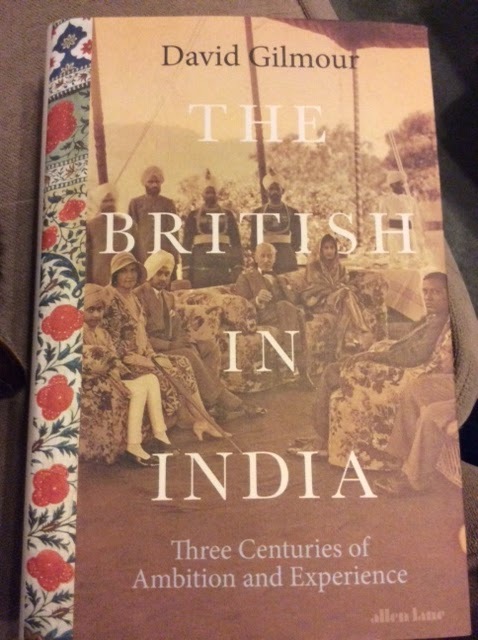 I may have also bought a rather attractive book by David Gilmore on three decades of the British in India. His talk, the first I attended, was articulate, well researched and a story compassionately told. I might also have bought a further Ishiguro novel, When We Were Orphans and there is a possibility I popped into the original Oxfam bookshop and found a Bernhard Schlink I have not read before. More blog fodder for my to-be-read shelf. And before I leave you this time, I must flag up hubby and his amazing efforts to raise money for Dementia UK. In denial of his 50th birthday, he is proving his body still works by completing 50 sports in as many days. 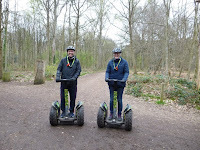 I've been on a few, but yesterday's forest Segway trail was the most fun so far. Thanks to all of the folk who are helping him, accompanying him or giving money. It's my half century next year...could I read 50 books in 50 days do you think?